Apartment Zero in Penn Quarter has been a go-to spot for trendy and stylish furniture and home accessories since it opened in 1999, and their spacious store allows them to carry a wider range of goods than most local independent shops. Their eye for design goes all the way down to kitchen implements, and they carry a variety of high-end implements for cheese lovers. 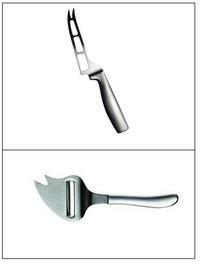 The stainless steel "Collective Tools" line from Iittala of Finland includes a cheese knife (pictured top) for $55 and a slicer for $45. For those with even more expensive tastes, Pott of Germany has a line of stylized cheese knives and planes with names like Picado ($138), Formado ($172) and Raspado ($137, pictured bottom). Apartment Zero is located at 406 7th Street, NW. They are open Wednesday through Saturday from 11 AM to 6 PM and Sundays from 12 to 5 PM, but they are closed on Mondays and Tuesdays. homebody, located across from the Marine Corps barracks that give Capitol Hill's Barracks Row its name, carries an assortment of furnishings and gift items sourced by owners Erin Mara and Henriette Fourcade. They run the gamut from high-end furniture and home decor to smaller accessories and gift ideas. One such idea immediately caught my eye as a great gift for cheese-lovers who enjoy serving their favorites to friends and family: a set of 6 cheese markers and a washable felt pen. I own a similar set of markers (mine are shaped like cows, sheep and goats) and I frequently use them when serving new or unfamiliar cheeses to help people keep track of what they're eating. 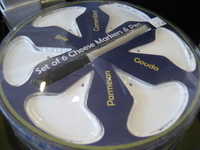 This set offers two distinct advantages - a larger writing space (so you don't have to struggle to fit the full name of the cheese) and a generic shape that allows all six tags to be used with any kind of cheese. The set retails for $22.50 at homebody, which is located at 715 8th Street, SE. They are open Tuesday through Saturday 11 AM to 7 PM and Sunday 12 to 6 PM, and they are closed on Mondays. Home Rule is another independently-owned and operated shop that specializes in "goods that are distinct, well-made, useful, well-priced." They focus on well-known product lines like Simplehuman and Umbra, but they also feature a wide range of fun and playful products for the kitchen and bath. A few of their products are even available online through their website. That's where I found these mouse-shaped cheese graters from Christopher Raia Studio. I couldn't help but smile when I saw the simple (but fun) design, and I was impressed that the mouse doubles as a serving bowl once you've finished grating the cheese. At $9.99, this would make a great stocking stuffer for fun-loving cheese lovers young and old. If you'd rather buy in store, Home Rule is located at 1807 14th Street, NW, just a few blocks south of U Street. They are open from 11 AM to 7 PM Monday through Saturday, and 12 to 6 PM on Sundays. Of course the most obvious gift for cheese lovers is - wait for it - cheese. Both Cheesetique and Cowgirl Creamery offer tasting classes in their stores covering a wide range of topics. Cheesetique tends to offer a single class on multiple evenings each month, while Cowgirl offers numerous one-shot classes. Recent classes at Cheesetique have dealt with blues, local cheeses and "stinky" washed-rind varieties. Their current tasting focuses on "holiday" cheeses (their writeup encourages you to "Think cranberries. Think truffles."). At Cowgirl Creamery, recent offerings have focused on artisan cheeses from Ireland, France and American farmsteads. Prices can vary, so your best bet is to contact the stores directly to inquire about upcoming tastings. Local cheese shops also offer holiday cheese trays for entertaining and "cheese collections" to give as gifts. Bowers Fancy Dairy Products recommends a tray of red port-soaked cheddar and green sage derby for a festive plate. Cheesetique is happy to help you build your own cheese platter with 4, 5, or 6 cheeses in a variety of styles. Naturally, prices vary depending on the cheeses you select. And Cowgirl Creamery's website offers a "Holiday Cheese Board" featuring three American artisan cheeses: Uplands Farm Pleasant Ridge, Cowgirl Creamery's own MT TAM, and Colston Bassett Stilton (pictured). This collection of cheeses, which retails for $68 online, makes a great gift or a ready-made cheese board for entertaining. If you're stuck for a specific gift idea (or if you're just tired of giving a bottle of wine every time you visit a friend's house), consider a gift certificate to a local cheese shop. They are available in a range of denominations, and they allow the recipient to treat himself or herself to something they might not otherwise buy. Were it not for a gift certificate to Cheesetique, my wife and I might never have tried Cassina Rossa's Truffle & Salt, a decadent blend of sea salt and black truffles that adds an earthy richness to risotto and pasta dishes. Whenever possible, we like to shop local, independent businesses like these (with the exception of Cowgirl Creamery, though its founders ARE locals). They offer interesting and eclectic selections that frequently reflect the personal taste and style of the store owner, and they are a great way to learn about designers and product lines that may not be carried in larger chains. I've tried to include suggestions for a range of budgets and tastes, but the best advice I can give you is to go out and look for yourself - take advantage of the opportunities that living in and around Washington provides and keep an eye out for something unique. 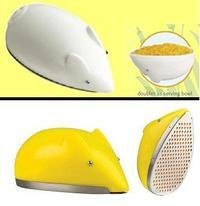 Oh wow, that cheese grater mouse is going on my wishlist right away! As a matter of fact you have put me in such a cheesy mood I think I will go to Cowgirl Creamery for lunch today! Hmmmm, I belong to a wine tasting book club and always bring the cheese, since I bring the "weird stuff" as someone has been quoted as saying (otherwise, we would end up with Kraft cheddar - no kidding. Bleh). After a few glasses of wine, some folks get confused as to the cheeses. I am thinking I need one of those cheese markers sets. Awesome. I definitely have a few cheese lovers on my list, thanks for the suggestions!